Milk Protein Concentrate, Natural and Artificial Flavor, less than 2% of the follow: Vitamin and Mineral Blend (Salt, Ascorbic Acid, Zinc Gluconate, dl-Alpha-Tocopheryl Acetate, Niacinamide, Manganese Gluconate, Calcium Pantothenate, Vitamin A Palmitate, Pyridoxine Hydrochloride, Thiamine Chloride Hydrochloride, Riboflavin, Chromium Chloride, Folic Acid, Beta-Carotene, Vitamin D3, Biotin, Sodium Molybdate, Sodium Selenite, Potassium Iodide, Phytonadione, Cyanocobalamin), Carrageenan, Xanthan Gum, Sucralose, and Acesulfame Potassium. Milk Protein Concentrate, Cocoa Powder (processed with alkali), Natural and Artificial Flavor, less than 2% of the follow: Vitamin and Mineral Blend (Salt, Ascorbic Acid, Zinc Gluconate, dl-Alpha-Tocopheryl Acetate, Niacinamide, Manganese Gluconate, Calcium Pantothenate, Vitamin A Palmitate, Pyridoxine Hydrochloride, Thiamine Chloride Hydrochloride, Riboflavin, Chromium Chloride, Folic Acid, Beta-Carotene, Vitamin D3, Biotin, Sodium Molybdate, Sodium Selenite, Potassium Iodide, Phytonadione, Cyanocobalamin), Carrageenan, Xanthan Gum, Acesulfame Potassium, and Sucralose. Milk Protein Concentrate; Less Than 2% of the Following: Vitamin and Mineral Blend (Salt, Ascorbic Acid, Zinc Gluconate, dl-Alpha-Tocopheryl Acetate, Niacinamide, Manganese, Gluconate, Calcium Pantothenate, Vitamin A Palmitate, Pyridoxine Hydrochloride, Riboflavin, Chromium Chloride, Folic Acid, Beta-Carotene, Vitamin D3, Biotin, Sodium Molybdate, Sodium Selenite, Potassium Iodide, Phytonadione and cyanocobalamin), Carrageenan, Xanthan Gum, Sucralose, and Acesulfame Potassium, and Red 40 Lake. 2. Enjoy as a snack or post-workout combined with a healthy diet and exercise program. Great snack and additional protein source. 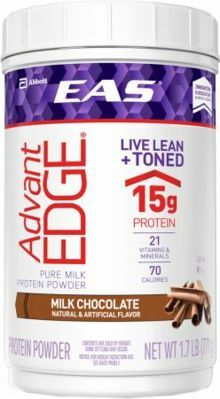 EAS SPORTS NUTRITION IS THE FIRST MAJOR BRAND TO ACHIEVE 100% third party CERTIFICATION FOR OUR PRODUCTS.